UPHOLSTERED HEADBOARD BED: Transform your master bedroom into an Old-World oasis with this dynamic Upholstered Headboard Bed. 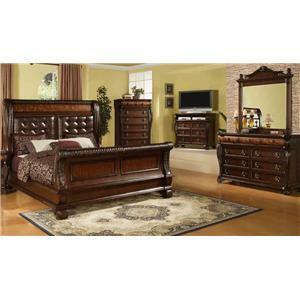 The headboard features an expensive burl inlay molding made out of a stunning inlaid burl veneer. Adding a sense of comfort and refinement is a "faux" leather polyurethane tufted headboard that can easily be cleaned and last for years to come. 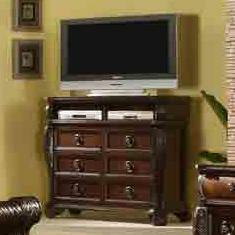 This dining room storage piece will add function and style to your formal dining room. 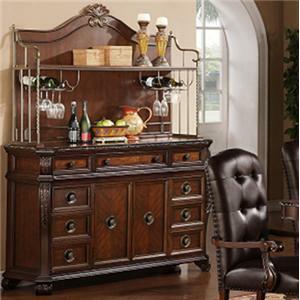 Durably constructed, the buffet features fancy ash burl veneers,traditional carved detailing, and unique drawer pulls. Felt lined drawers are ideal for silverware and other precious items, while the lower cabinets and additional drawers offer plenty of space for linens, china, and larger serving pieces. The hutch adds even mores storage, with a larger shelf to display your most prized serving pieces, and wind bottle and stemware storage. Transform your master bedroom into an Old-World oasis with this dynamic Upholstered Headboard Bed. 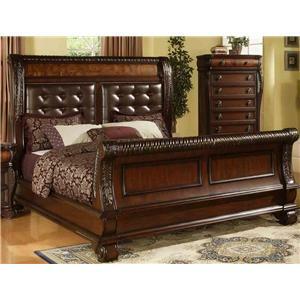 The headboard features an expensive burl inlay molding made out of a stunning inlaid burl veneer. Adding a sense of comfort and refinement is a "faux" leather polyurethane tufted headboard that can easily be cleaned and last for years to come. As if this bed wasn't beautiful enough, waist molding, paneling, scroll legs, and intricate carvings in the shapes of acanthus leaves are added for a final touch. 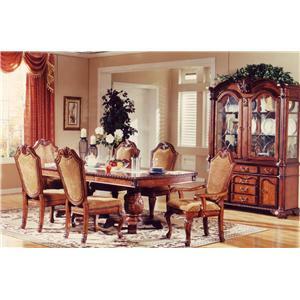 Entertain guests in style with this gorgeous traditional dining set. 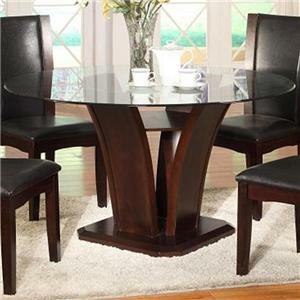 The large scale double pedestal table can easily seat up to eight comfortably. Upholstered arm and side chairs are covered in a soft, gold-toned fabric with exquisite chair back molding and cabriole legs. The set is finished in deep rich warm walnut stain with ash burl inlays. Pair with the matching china cabinet for the complete collection. 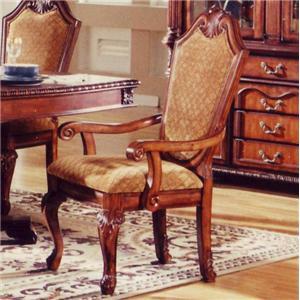 This stylish traditional dining arm chair offers a touch of luxury for your formal dining room. The plush button tufted seat is made of rich brown faux leather, creating a durable and comfortable seat, with nail head trim accents. Elegant scroll arms and cabriole legs with a scroll foot detail complete this regal style. You can have a sophisticated addition to your dining table with this side chair. The piece carries a burnished brown finish and features a black upholstery, which provides a beautiful contrast. Plus, the tapered apron on the seat side provides added strength and a polished look. Simply stunning, this side chair is sure to please. Fusing style and practicality, this TV stand allows you to store clothes linens, display a TV while keeping wires and electronics well organized with two open compartments. Not only functional, the soft curves, scroll feet, waist molding, and acanthus leaf carvings give this piece a sophisticated quality perfect for a master bedroom. From the unique hardware to the rich stunning finish, this piece is sure to make a statement. This cool contemporary dining table will be a nice addition to your kitchen, breakfast nook, or casual dining room. The rich dark espresso pedestal base features curving lines, and a center shelf for stashing a book, magazine, or game. A round glass table top completes this casual yet sophisticated style. This contemporary dining chair will look great in your dining room. 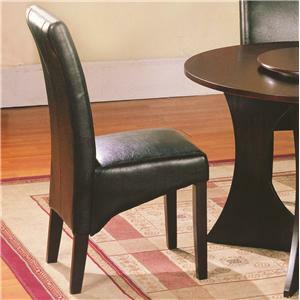 The sleek side chair features a high wood framed back and tapered legs in a rich dark espresso finish, with a durable black faux leather upholstered seat and back. 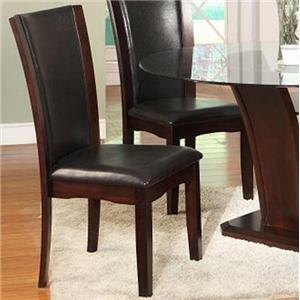 Perfect for everyday use, this sophisticated style will add a modern touch to your casual or semi-formal dining room. 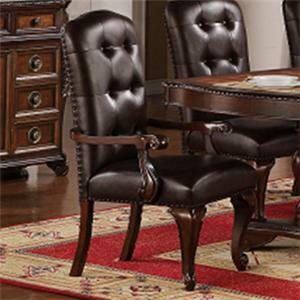 Dine like royalty with this beautiful dining arm chair. The padded seat and backrest is upholstered in a gold toned fabric to beautifully contrast the warm walnut stained finish. Elegant wood shaping, moulding, and front cabriole legs maintain a formal traditional silhouette. Pair with the matching dining table for the complete set.